Oliver McBurnie is among a group of burgeoning young Scots eyeing a pathway into the English Premier League with Swansea City. Stephen Kingsley, the 21-year-old former Falkirk left-back, has started two of the Welsh side’s last four matches – victories over Arsenal and Aston Villa – and presently acts as the standard-bearer for Jay Fulton, Adam King, Ryan Blair and 19-year-old McBurnie. The last-named, a striker born into a Scottish family based in Leeds, joined Swansea on a three-year contract from Bradford City last summer and craves a taste of first-team football in the richest league in the world. He has had to put that hope on hold for now, with opportunities for young players to be pitched in reduced by the fact the Liberty Stadium have been in a relegation battle this season. McBurnie is currently on loan at League Two side Bristol Rovers until the end of the season after a stint in the same division with Newport County earlier in the campaign. His recent elevation from Scotland under-19s to U21 level has raised his profile further as he strives to follow his international team-mate Kingsley into the Swansea first team early next season. “When I was playing for the Swansea U21s before going out on loan I was scoring and training with the first team most days,” he said. “I’m confident when I go back that I’ll be able to fight for my place and get my chance. It’s just tough when they’re struggling near the bottom. “When a club is in a relegation battle, they’re less likely to throw in the youngsters. Stephen has done well when he’s been thrown in and Jay Fulton is the same. “It’s good for youngsters like myself to see that because the gaffer might trust the youngsters a bit more. Kingsley’s route into the first team involved loan stints at Yeovil Town and Crewe Alexandra. McBurnie, therefore, knows dropping down the divisions is all part of the process. After joining Bristol City earlier this month, he is hopeful of helping his temporary team seal promotion to League One. “Swansea are in a relegation battle and the idea was for me to go out and get a few games before the end of the season,” he said. 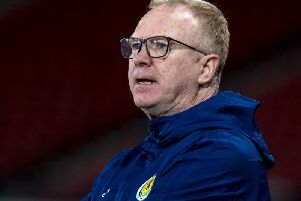 McBurnie has made two substitute appearances for Scotland U21s, with the most recent of those coming last week when he replaced Jason Cummings late in the 2-0 defeat by France. That result means Ricky Sbragia’s side must beat Northern Ireland in Paisley today to have a realistic chance of finishing second in their European Championship qualifying section. “We’ve looked at the table and we’re still confident if we pick up a few good results that we can sneak into that second spot and a possible play-off place,” said McBurnie.